NC Mountains Vacation Cabin Rentals. 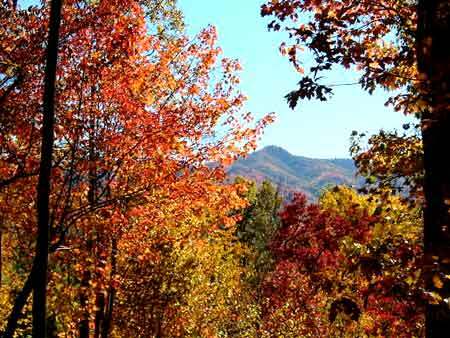 NC Mountain Fall Leaf Colors Information. 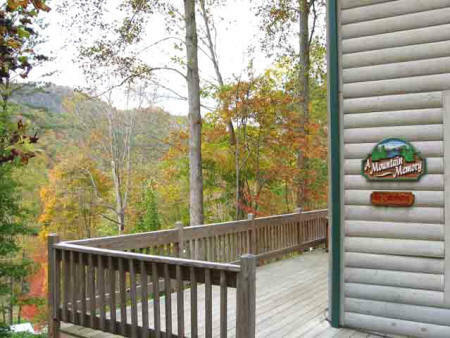 Cabin for rent near Nantahala Outdoor Center White Water Rafting NOC. Nantahala NC Macon County. NC Mountain Vacation Cabin for rent near Nantahala River White Water Rafting. Southwestern North Carolina vacation rentals. NC Smokey Mountain vacation homes and log cabins for rent. Vacation homes for rent in the South West North Carolina Smokey Mountains. Cabin rentals on Lake Nantahala and the Nantahala river. NC mountain Cabins for rent close to the Great Smokey Mountains National Park, Bryson City NC, Lake Fontana, Andrews NC, Murphy NC and Franklin NC. Don't miss the fabulous Autumn Leaf Season... reserve early. 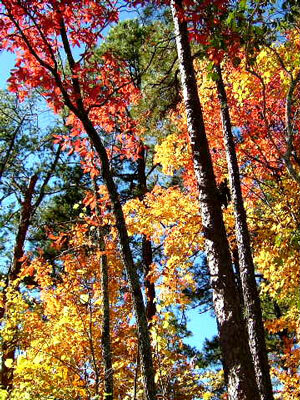 More fall leaf color information. There is a two night minimum all year and a three or four night minimum for most holidays. The rates for the cabins do not include the taxes or the $25 one time reservation fee. Rates may be subject to change, please call for the current rate. A 50% deposit plus the $25 reservation fee is required to hold a cabin. The Reservation can be immediately confirmed by credit card or we will hold the reservation for five days until a check arrives. Checks can only be accepted 21 days prior to the reservation. Cancellation policy: We know that plans can go astray. However we rely primarily on advance reservations, and cancellations cannot always be filled. So to be fair to all concerned, our policy is as follow: The booking fee is not refundable. Any Rental Fees paid, less a $50 processing fee and less any credit card fees, are refundable, if the reservation is cancelled at least 60 days prior to the arrival date. If you cancel during the 60 days prior to your arrival, you will forfeit all Rental Fees collected. If the cancelled reservation is rebooked, we will refund your forfeited Rental Fee, less a $50 processing fee plus any credit card fees, after the end of that rental. No shows will be charged in FULL unless the cabin is re-rented. We recommend that you purchase Trip Insurance to cover the potential financial loss. Visit InsureMyTrip.com for details. We accept VISA, Master Card and Discover cards. We can not accept personal checks for a final payment unless they are received 21 days prior to the arrival date. Vacation homes for rent in South Western North Carolina. Vacation homes for rent by owner. Vacation cabin rentals on the nantahala river. Vacation house rentals. Romantic vacation cabin with Jacuzzi for rent. Honeymoon vacation cabin with Jacuzzi for rent. Southwestern North Carolina Vacation cabin rentals with hot tub. Water lakefront vacation home for rent in Georgia and North Carolina. Vacation cabin rentals with hottub. Southwest North Carolina vacation house rentals with hot tub, spa, North Carolina travel, north carolina tourism, north carolina vacation, asheville north carolina, ashville north carolina, boone north carolina, cherokee north carolina , blowing rock north carolina, franklin north carolina, brevard north carolina. whitewater rafting in north carolina, tennessee whitewater rafting, nantahala white water rafting, nanthala, nantehala, nantahale, nantala, nantahala river kayak, nantahala rafting, nantahala national park, ocoee river rafting, white water rafting, nantahala outdoor center, nantahala national forest, nantahala river lodging, great smoky mountains cabin rentals, cabin smoky mountains. 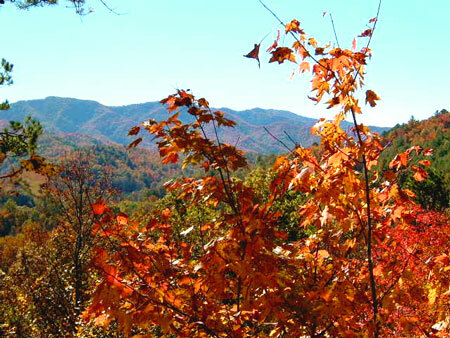 mountain vacations of north carolina, smokey mountain vacations, north carolina mountain vacations. georgia mountain vacations, smoky mountain vacations. Gatlinburg cabins, gatlinburg cabin rentals, pigeon forge cabins and gatlinburg mountain cabin rentals.